Since early 2010 I have been arguing in these pages against the core neo-Keynesian precepts of the economic and monetary policy mainstream. In general I have not been optimistic that, notwithstanding their abject failure to foresee the global financial crisis, and their ongoing, failed responses thereto, the mainstream would reconsider its views. But some interesting developments on multiple fronts indicate that they are doing just that. So does this represent the beginning of the end of the flawed neo-Keynesian policies that treat debt rather than savings as real wealth; consumption rather than investment as sustainable growth; and money as something to be manipulated to ‘manage’ the economy? Sadly, no. While they may realise that their policies are failing, what they are now contemplating is an even more radical programme of outright debt monetisation, wealth confiscation and vastly expanded central planning. Investors must take appropriate actions to protect themselves now, before such policies are implemented. [G]ridlock, it would seem, makes it all the more likely that the government is going to go right on doing more or less as it has done during the past few years. This is made all the simpler by the fact that the vast bulk of the US federal budget is non-discretionary. Yes, that’s right: All the time and money spent lobbying and lawmaking in Washington may keep the local economy booming and fill the newspapers with all manner of suspenseful headlines but, in reality, it is increasingly irrelevant with respect to the overwhelming portion of the federal budget, which grows automatically and is no longer just chronically in deficit, but amidst weak economic growth, exponentially so. So now, with the US elections settled, let’s step back and take in the larger, global picture. It isn’t pretty. It might seem like yesterday to some but it was already in 2009 that politicians in Europe began to talk about ‘austerity’, a concept that quickly became the new black in European political fashion. In brief, austerity in Europe is based on the idea that the accumulated sovereign debts are now dangerously large and need to be reduced by some combination of temporary (so they claim) tax increases and spending cuts. Once the debt is reduced to a more manageable level, so the thinking goes, taxes can be cut and spending restored to the previous level. Sounds oh-so reasonable now, doesn’t it? The problem is, however, it isn’t working. As we approach the end of 2012, in every instance of austerity being applied, economic growth is weaker and government deficits higher than projected, the result being that the accumulated debt burdens continue to grow. Indeed, they are growing more rapidly than prior to the onset of austerity! The simple math of the matter is that unless borrowing costs fall substantially, austerity will fail. But how to bring down borrowing costs when private investors are not convinced austerity is going to work? Why, have the ECB take a much larger role. Hence the showdown between the German Bundesbank, opposed to open-ended bank and sovereign bail-outs, and, well, just about every euro-area politician, policy maker and Eurocrat involved. Let’s briefly explore this important tangent. To outside observers, this situation may seem rather odd. Following the introduction of the euro, the Bundesbank ceded power over German monetary policy and, by extension of the German mark’s previous role as anchor currency, over euro-area monetary policy as well. (The Bundesbank retains an important regulatory and supervisory role with respect to German financial institutions.) So how is it, exactly, that the Bundesbank is somehow in a position to resist what has now become a near universal euro-area march toward some form of debt monetisation? Well, as it happens, the German public hold the Bundesbank in rather high regard. Most Germans recall how the Bundesbank long presided over Europe’s largest economy, maintaining price stability and fostering a sustained relative economic outperformance. Many Germans probably recall how, on multiple occasions, the Bundesbank successfully resisted inflationary government policy initiatives. Older Germans recall how the Bundesbank contributed to the Wirtschaftswunder (economic miracle) of the 1950s and 1960s. And Germans know that the ECB was supposedly modelled on the Bundesbank and the euro on the German mark. But what if she should fail? What if Weidmann does indeed resign in protest at some point? His former colleagues Axel Weber and Juergen Stark have already done so (In Stark’s case, from the ECB, not the Bundesbank). What if some of his Bundesbank board colleagues join him? I can’t emphasise this point enough: The institution of the Bundesbank is held in such high regard among the German public that should Weidmann and any portion of his colleagues resign in formal protest of bailouts in whatever form, it may well bring down the German government, throw any bailout arrangement into complete chaos, spark a huge rout in distressed euro-area sovereign and bank debt and quite possibly result in a partial or even complete breakup of the euro-area. The Bundesbank thus represents the normally unseen foundation on which the entire euro project rests. Should it remove its support, it may all come crashing down. But why would the Bundesbank ever do such a thing? Isn’t it just a bureaucracy like any other, expected to serve the government? Well, no. Consider the unique role of the Bundesbank under German Law. It is not answerable to the government. It is its own regulator. Its board members are appointed by the president—the head of state—not the chancellor, the head of the government. Its employees are sworn to secrecy during both their active service and in retirement. The Bundesbank alone determines whether its employees have infringed its code of conduct and determines what disciplinary actions, if any, should be taken. Weidmann’s intransigence is thus entirely in line with German law and tradition. The Bundesbank, by design, will confront the government if it believes that such action is necessary to carry out its mandate. And what is that mandate? As per the original Bundesbank Act, “The preservation of the value of German currency.” Previously the mark, the euro is now the German currency and the Bundesbank’s mandate is to preserve its value. Needless to say, open-ended bailouts of euro-area banks and sovereign countries would, without question, threaten that value. You can be certain that when President Weidmann said earlier this year that what was being proposed by the ECB “violated its mandate,” he chose his words very, very carefully. In a subsequent speech on the same topic, he quoted from Goethe’s Faust, arguably the most famous play in German literature and a classic warning against hubris and temptation. You don’t do that if you are not deadly serious.5 The implication, no doubt, is that Weidmann is sending a message that the Bundesbank is independent of the ECB with respect to determining whether or not ECB policies are consistent with “the preservation of the value of German currency,” which now happens to be the euro. The Bundesbank has thus re-assumed this dormant but ultimate power over German monetary policy. Under just what circumstances it will choose to exercise it, I don’t know, but if the German and other euro-area governments continue along the road to bailouts, it will almost certainly happen at some point, presenting the greatest challenge yet to the sustainability of EMU in its current form. As mentioned earlier, austerity isn’t working, in many countries largely because borrowing costs are not declining. But if austerity were credible, they would. What is it about austerity as implemented that is failing to win over bond investors? Second, consider that the countries in question have enormous accumulated debt burdens, in some cases previously disguised and underreported. Cooking the books does not instill investor confidence. Yet paying down such a large debt mountain is going to take a long, long time. Today’s investors need to trust not only today’s politicians, but their successors down the road, to make good on promises that will remain subject to political opportunism and expedience for many years. Third, governments may talk a good game but can they walk the walk? A close look at European ‘austerity’ legislation reveals that actual spending cuts are few and far between. What is being proposed in most cases is that the rate of spending increases declines. But an increase is still an increase and absent healthy economic growth needs to be financed with, you guessed it, more debt. Investors may want to see real rather than ‘faux’ austerity before accepting lower debt yields. Fourth, let’s consider the possibility that what investors are really interested in is not some accounting plan that looks nice on paper, assuming governments can rein in runaway spending, but rather a more comprehensive plan that fundamentally reforms economies, making them more flexible and competitive. If growth is not to be provided by deficit spending—the traditional welfare state model—it must be provided by an unsubsidised private sector. If an economy lacks capital or skilled workers, or taxes either labour or capital at too high a rate, it is not going to be able to grow and pay down debt. Such fundamental reform remains essentially off the table in the austerity plans discussed to date. Finally, let’s turn to a technical but extremely important point, namely, how austerity as observed in practice adds further evidence to the already substantial pile demonstrating that the dominant neo-Keynesian paradigm held by the economic policy mainstream is itself deeply flawed. The difficulties with austerity go beyond merely placating the bond markets. The fact is, a large debt burden is a huge economic problem. Sure it is preferable to be able to finance the debt at low rates, but if you want to pay it down you must divert resources from elsewhere. That is going to be painful at any interest rate. But such are the political pressures on the modern welfare state that the accumulation of an excessive, unserviceable debt over time is a near certainty. Why should this be so? Well, back in the days before the modern welfare, or ‘nanny’ state, politicians didn’t pretend to have solutions for everything. If you were overweight, it was your problem. If your kids didn’t learn basic reading, writing and numeracy, at home or at school, it was their problem. With the growth of the welfare state, however, more of your problems become politicians’ problems and, by extension, those of the taxpayers who must provide the funds for the ‘solutions’. As the tax burden grows over time, however, taxpayers gradually begin to resist tax increases. In practice, this has resulted in the welfare states steadily accumulating debt, as taxpayers have repeatedly refused to pay the high rates of tax up front to finance the welfare policies in question. Now it could be and frequently is argued that taxpayers are just being schizophrenic. After all, in many welfare states, the average taxpayer is a major receiver of benefits, including publicly provided heathcare and education. So it is not just a case of certain distinct members of society financing the welfare of others. Fair enough. But this just demonstrates that taxpayers in welfare states are suffering a collective ‘tragedy of the commons’ in which each tries to extract maximum benefit for minimum cost. The result is a steadily accumulating debt, representing that portion of welfare not covered by current tax revenues. The dangers of an accumulating debt can be disguised, however, as long as economic growth appears healthy enough to service the debt. This is where the so-called ‘multiplier’ comes in. As the debt grows, it adds to GDP growth via the multiplier effect: For each unit of deficit spending, the economy will in fact grow by some multiple of that. (This is because deficit spending creates money through borrowing that would not otherwise have been created and this new money flows out into the economy where it stimulates growth generally). This process can go on for many years, as we have seen. The neo-Keynesian economic mainstream doesn’t see anything wrong with this in principle, as long as debts don’t become excessive relative to GDP. But welfare politics being what they are, they do. (It is a rare welfare state indeed that can rein itself in as debts swell. Indeed, the exceptions that prove the rule here are few and far between and are explained primarily by natural economic advantages.6) When a welfare state finally reaches the limits of debt accumulation, as the bond markets refuse to finance any further increase in debt at serviceable rates, some form of austerity would seem to be required. Now the slope of the line through the data is meant to show the forecast error based on the old multiplier assumptions, in other words, the extent to which the IMF has got things wrong. 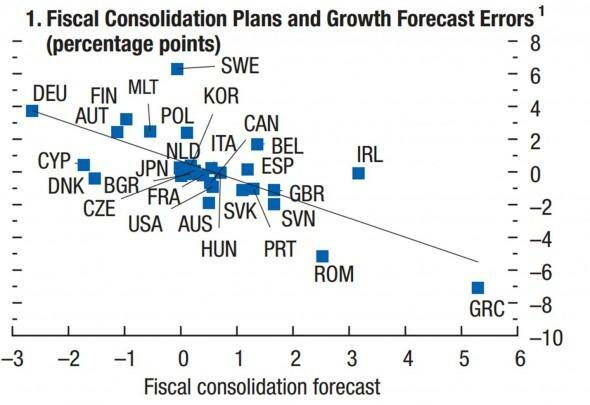 Note Greece in the lower right corner, representing the unanticipated negative effects of a rather extreme fiscal tightening, and Germany in the upper left, representing the forecast error associated with a moderate fiscal expansion. But if you eliminate these two extreme observations from the sample—something any good statistician would do as a reality check—guess what? You are left with a statistically insignificant ‘blot’ of observations from which you can’t really conclude anything. In other words, the IMF is jumping to conclusions. Now why might that be? I have an idea. Consider: Some of the more outspoken Keynesians wasted no time touting these findings as ‘proof’ that austerity can’t work; that what is really needed is more stimulus, not less; that their arch-Keynesian views have now been vindicated! Among this group are Paul Krugman, who never saw a stimulus he didn’t like; and former Fed economist Richard Koo of Nomura, who shows a bit more discretion in his views. But in this case they are on the same page: The IMF data are clear, unambiguous evidence, in their view, that the problems created by excessive debt are best addressed with more debt, rather than less. Logic, apparently, is mere inconvenience for those with a PhD in Keynesian economics, as are questionable, cursory statistical analyses, normally referred to pejoratively as ‘data-mining’. Now that we have seen how two prominent Keynesians have responded with applause to an unabashedly Keynesian-inspired IMF study, let’s step back and consider the broader implications for a moment. As is the case with many policy papers, this one is perhaps more notable for what it doesn’t say than for what it does. Consider: Even if the IMF paper is correct in its questionable statistical observations, why, exactly, might the multiplier be larger on the downside than on the upside? Could it be that the net economic benefits of borrowing and consuming through the years are more than outweighed by the eventual requirement that the accumulated debts are paid down? Could it be that borrowing and consuming your way to prosperity doesn’t actually work? Or, conversely, that good, old-fashioned saving and investing your way to prosperity does? The IMF does not ask and thus does not even begin to answer these common-sense questions. If it did, it might come to some rather common-sense conclusions. That they just perform a data-mining exercise, apparently to serve an agenda, rather than ask and answer the real questions, is yet more evidence that the dominant neo-Keynesian paradigm is being exploited by self-serving policymakers seeking any excuse they need to keep borrowing, spending and consuming, so that the inevitable, unavoidable hard choices need not be made on their watch. Leave it rather to their successors or, better yet, the next generation, or the generation after. After all, isn’t it just human nature for parents and grandparents to expect their children and grandchildren to take care of them in their old, infirm age? In any case, it takes hard work and some sacrifice to actually provide for the next generation to have a higher standard of living. But hey, we’re rich enough as it is, aren’t we? Isn’t poverty a thing of the past? And don’t we aspire to higher things these days like economic equality, political correctness, or ‘nanny’ rules and regulations to keep us from smoking, or drinking, or gambling, or whatever other immoral, reprehensible, irresponsible behaviours? Worrying about debts and budgets is just so passé! Well, ask the Greeks or the Spanish how they feel about political correctness these days. Or ‘nannystate’ rules on personal behaviour. Something tells me they might be rather more concerned with putting food on the table. And something tells me that the theoretical future of the welfare state, long predicted by von Hayek, von Mises, Friedman, Buchanan and other notable, non-Keynesian economists, is rapidly colliding with the actual present, in a list of countries that continues to grow. Before we move to the next topic, some readers might be asking themselves, if neither ‘austerity’ nor stimulus is the answer, what on earth is? My answer to this question is that the ‘faux austerity’ I mentioned earlier isn’t really austerity at all. Tightening the screws on a failing welfare state without fundamental reform is not going to convince investors to hold additional debt. Corporations that are fundamentally uneconomic need to do more than cut a few costs here and there if they want to rollover their debts. They need to engage in some ‘creative destruction’ of their operations.9 Anything less, and bond investors will walk away and leave them to their fate. Unfortunately, the political processes of the modern welfare state, entrenched as they are in administering entitlements of various kinds, do not lend themselves to fundamental economic reform. Thatcher’s near-bankrupt Britain is a rare exception, in which a highly charismatic politician, against all political odds, took a principled stance against the relentless growth of the welfare state and managed to slow its growth for a time. She didn’t stop it, however, something that the present British government, soon to face near-bankruptcy yet again, no doubt regrets. While Keynesians prefer to ignore relevant examples, the fact is, real austerity is possible. Look at the Baltic States of Estonia, Latvia and Lithuania. Look at Bulgaria, or Slovakia, or Iceland. Look at South Korea, Thailand, Malaysia and other Asian countries hit hard by their collective debt crisis in the late 1990s. It can be done. But it implies real economic hardship for a period of time and it goes right to the heart of the government, which must shrink relative to the private sector. Many career politicians and bureaucrats will simply find that they are out of work and that they must seek private sector jobs, without guaranteed state pensions and other benefits, like most ordinary folks. The reality of contemporary welfare state politics being what it is, I would argue that there is essentially zero chance that the Keynesians in charge are going to do an about-face. Sure, they might have realised that their policies are not working, but this just means that they are going to raise the stakes. As some are now beginning to argue, there is in fact no reason to worry. Austerity might not work once you are stuck in a debt trap, but so what? What if you could just wave a magic wand and make the debt disappear? Now that would solve all our problems, wouldn’t it? [T]he paper sets up an entirely new and I believe bogus problem based on the premise that in our monetary system money is supposedly provided ‘privately’, that is, by ‘private’ banks, and ‘state-issued’ money only plays a minor role. From this rather confused observation, the paper derives its key allegation that ‘state-issued money’ ensures stability, while ‘privately-issued money’ leads to instability. This claim is not supported by economic theory… Monetary theory does not distinguish between ‘state-controlled money’ and ‘privately produced’ money, it is a nonsensical distinction for any monetary theorist. An attempt to give credence to this distinction and its alleged importance is made in a later chapter in the Benes/Kumhof paper but, tellingly, this attempt is not based on monetary theory but on an ambitious, if not to say bizarre, re-writing of the historical record. In recent decades, the global banking system found itself on numerous occasions in a position in which it felt that it had taken on too much financial risk and that a deleveraging and a shrinking of its balance sheet was advisable. I would suggest that this was the case in 1987, 1992/3, 1998, 2001/2, and certainly 2007/8. Yet, on each of these occasions, the broader economic fallout from such a de-risking strategy was deemed unwanted or even unacceptable for political reasons, and the central banks offered ample new bank reserves at very low cost in order to discourage money contraction and encourage further money expansion, i.e. additional fractional-reserve banking. It is any wonder that banks continued to produce vast amounts of deposit money – profitably, of course? Can the result really be blamed on ‘private’ initiative? To answer Detlev’s rhetorical question: Of course not! Just because commercial banks are legally private entities does not in any way imply that they are not de facto agencies of the government. Fannie Mae and Freddie Mac were private sector entities too, prior to being placed into official government ‘conservatorship’, albeit ones engaged in even narrower, more heavily regulated activities than ordinary commercial banks. Perhaps the best way to think about how banking institutions have operated in recent decades is as private utility companies, with their activities heavily regulated and subsidised by the central bank and a handful of government agencies. Or, to use another industry as an example, consider defence contractors. Sure, they might be private firms in the legal sense, but the business in which they are engaged—defence—is so intertwined with the activities of government that it is essentially impossible to distinguish just where the public role ends and the private role begins. No doubt the legal grey area that exists between public and private activities in any industry is fertile ground for corruption and abuse. In finance, however, this grey area reaches right into the heart of the money and credit creation process and, thereby, has an insidious if largely unseen impact on the entire economy. To blame ‘private sector’ money and credit growth for the mess we are in, as Messrs Benes and Kumhof do in their paper, demonstrates either colossal ignorance or disingenuousness. I leave it to the reader to decide which. If while reading the above you thought that what in effect is being proposed is a massive monetisation of debt, you are right. That is exactly what it is. All but the most radical of Keynesian economists, however, refrain from using the ‘m’ word. They prefer wonkish terms like ‘quantitative easing’ for example. Or, when there is natural downward pressure on prices, they say extreme measures are called for due to ‘inflation targeting’. When they get really desperate, they do occasionally refer to things like the ‘printing press’ or even ‘helicopters’, but somehow the ‘m’ word is something only ever contemplated by two-bit dictators, be they fascist, communist or some combination of the two. After all, monetisation is blatant, in-your-face wealth confiscation from private sector savers to public and financial sector borrowers. Modern, enlightened welfare state democracies would never contemplate such a thing now, would they? Yes, I’m being faceitious yet again. But come on folks, the idea that somehow, by calling ‘monetisation’ something else makes it so, is just another example of the intellectual sophistry being practiced at the IMF and elsewhere in Keynesian policy circles. They are playing a semantics game while trying desperately to get governments the world over to get on with outright debt monetisation, assuming that this would never morph into a hyperinflation or other such economic calamity. Ah, but it might. Sorry to sound alarmist, but at some point it might. Reality is a harsh mistress. The future has a way of arriving now and again, sometimes when you least expect it. Responsible folks need to take a sober look at the road we are on. Ignore the can being kicked along the road and focus instead on where the road leads. In this case, it leads to some combination of currency debasement, devaluation and debt default (with the latter substantially less likely, in my opinion, although I would not rule it out in certain cases). It might, just might, lead to a hyperinflation. So what is a defensive investor, interested primarily in wealth preservation, to do? My advice in this matter has changed little since the first Amphora Report went out in early 2010.14 Diversify out of financial and into real assets that cannot be debased, devalued or defaulted on. Within financial assets, overweight income-generating stocks in industries with pricing power, that is, those more easily able to pass cost increases through to consumers. Within real assets, acquire some physical, allocated gold and silver but note that these are already trading somewhat expensive relative to most other commodities. One important lesson of the Great Depression and other periods of severe economic deleveraging is that the prices of less fashionable commodities such as agricultural products can become extremely depressed from time to time and that they tend to outperform precious metals once they cheapen (in relative terms) to a certain point. I would argue that we are at or near that point already. The Amphora mantra has always been and remains to diversify. Diversification is the only ‘free-lunch’ in economics, frequent Keynesian claims to the contrary notwithstanding, and it is the best form of financial insurance there is. Better than gold. Better than silver, or any single commodity. Better than any one stock, or stock market for that matter. Better than any one bond market, or any one currency. In a world of not just known unknowns, but even unknown unknowns, it would be imprudent to place any number of eggs in just one basket. Even golden ones. “The More Things Change, the More They Stay the Same,” Amphora Report vol. 1 (November 2010). The link is here. “Caught in a Debt Trap,” Amphora Report vol. 3 (July 2012). The link is here. ECB President Mario Draghi affirmed this policy at today’s monthly ECB press conference and also suggested strongly that the ECB is likely to purchase substantially more debt in future. Among other German publications, Der Spiegel reported on this. The link to the article is here. Weidmann’s specific words, in German, for those interested, were the following: “Die Bundesbank steht hinter dem Euro. Und gerade deshalb setzen wir uns mit Verve dafür ein, dass der Euro eine stabile Währung bleibt und die Währungsunion eine Stabilitätsunion. Es gibt verschiedene Wege, dieses Ziel zu erreichen. Sicherlich nicht erreichen werden wir dieses Ziel aber, wenn die europäische Geldpolitik in zunehmendem Maße für Zwecke eingespannt wird, die ihrem Mandat nicht entsprechen. The link to this speech is here. His reference in a subsequent speech to Goethe’s Faust can be found at the link here. Those welfare states with manageable debt burdens tend to be endowed with plentiful natural resources, such as Norway, Sweden Finland, or Canada, for example. This makes them natural exporters and enables them to finance a certain degree of domestic welfare without resorting to chronic debt accumulation. The IMF World Economic Outlook can be found here. For more on the concept of a ‘debt trap’, please see “Caught in a Debt Trap”, Amphora Report vol 3 (July 2012). The link is here. I have written at length about the critical yet commonly overlooked role that Schumpeterian ‘creative destruction’ plays in a healthy economy. For a recent example, please see “Why Banktuptcy is the New Black,” Amphora Report vol. 3 (April 2012). The link is here. “There May Be No Free Lunch, but Is There a Magic Wand?” Amphora Report vol. 1 (September 2010). The link is here. The entire paper, The Chicago Plan Revisited, can be found on the IMF’s website here. Detlev’s paper is posted to his blog, linked here. I also highly recommend Detlev’s book, Paper Money Collapse, details of which you can also find on his blog. For those curious, German chancellor Bismarck introduced the first European pay-as-you-go state pension in the 19th century. It has served as the original model for state pensions subsequently introduced in most of Europe and North America. Germany was also an early adopter of compulsory public education. You can find the inaugural Amphora Report here.